How are we like humans? How are we unlike humans? 2) We are happy just “being present." We may not have learned the following lesson from Rylee, but it is a good one! Always trust your dreams. They've chosen you, as much as you've chosen them. That is how we felt about embarking on this journey! It's got to be about LOVE! Love is expressed through action, not words. When your actions don't match your words, I can't hear your "love." I love you, but I cannot accept your "lifestyle." What "lifestyle?" So, I lay around in the house and yard a lot. Big deal! I love you, but I cannot visit you or have you stay in my home. Ok, perhaps you are allergic to animals, but that is what is great about me! I am hypoallergenic because I don't shed! I love you, but I cannot attend your shower or your wedding, and acknowledge the love and commitment of your marriage. Hey, I am only 3 1/2. I don't even know if I want to get married. We animals love unconditionally. You humans might want to try it sometime! It is easy to love those who are loving. It is more challenging to love those who are not being loving. Love them anyway! Match fear with fear and you will have blind people. Match fear with love, and you will change the world! Dogs? We trust ourselves. Humans would better serve themselves and our world if they trusted their intuition more often. I trust what I feel. When I feel sleepy, I sleep. When I feel playful, I play, regardless of whether someone is home to play catch with me. When I feel hungry, I eat. When an unknown person approaches my home, I pay attention. I hear people ask, “Do you think Rylee enjoys her life?” Are you kidding me? It just doesn’t get much better than this. People think we dogs are bored because we sit or lie around a lot. Here’s my “woof” on the subject. If humans would learn to simply “be present” like I am, they would enjoy life more. I am not afraid of being still and quiet. It makes my playful times more energized and fun. Indeed, I have the life of Rylee! (: You can too! Tone of Voice DOES Matter! I want you to remember that your tone of voice is not insignificant. It resonates with either fear or love. I often teach Mama Rob and Mama Dot what they need to know. If their tone becomes one that does not empower our journey, I let them know by leaving my bed in the back seat, and crawling up in the middle of the Suburban and using my paw on their arms to alert them. I usually crawl into Mama Dot's lap. This is my "alert" signal. I want to constantly remind them and you of the importance of your tone of voice, and what that communicates (even when you think it doesn't). I do not leave until all is well. Do not forget this lesson! I was walking down the street with Mama Rob and Mama Dot. I heard a dog bark behind the fence. I could tell it was a big dog by the tone of its bark. What a sweet sound I thought. I felt myself leap into the air like the dog in the old Milk-Bone commercial, with all four feet leaving the ground. It was a leap for joy. I automatically assumed that this dog wanted to play and was friendly. I didn’t hesitate to experience excitement. I also want to ask humans, “Without realizing it, do you approach people/situations with apprehension rather than openness? Which approach do you feel will empower your life?” I want to share that life can be lived with joy…just ask me, Rylee Joy! I live it that way each day…come join me in the fun! There’s a saying we have in our Scotty trailer. Mama Dot put in on the cabinet before we left home. as though you have never been hurt. I took it to heart on Easter Sunday at the Gulley home in Indianapolis, Indiana. Phil and Joan invited us to church and Easter dinner. Their sons, Spencer and Sam, along with their cousins, played basketball all afternoon. Since it was a day for renewal and transformation, I figured that I would emerge from my dog status into a basketball player. Having never played before, even though Mama Dot used to be a basketball coach, I was excited. I didn’t care if the kids laughed at me…I wanted to play! I chased the ball, jumped up to block shots, and even snapped my jaws at a few of the kids! (Mama Rob got on me about that…she said it wasn’t the proper way to play, so I gave up on that technique). But I played as if no one knew I was a dog. I can’t be bothered with how others see me. I saw these kids playing basketball, and I wanted to play too. It isn’t any different than when Mama Rob and Mama Dot are traveling, and go into a pub where music is being played. They don’t ask “Is this a gay bar?” so that they can see if they have permission to dance. They hear music and they dance. We learn a lot from one another. If you want to dance, then dance! If you want to love, then love! If you want to sing, then sing! If you want to live, then live! If you, like me, want to play, then play! Embrace conflict, rather than stuff it. It will allow you to move through the pain and create a new understanding. It's really not as scary as you think (except between your ears). Doing otherwise creates emotional distance. No matter how difficult you find it to say what you truly feel, say it anyway! Talk...Talk...and keep talking in authentic ways to one another! Or, as we dogs say, Bark..Bark...and Bark some more! I love that song, "This Little Light of Mine." It is so simple. Why do humans have such a hard time with this simple truth? When in doubt, remember, "This Little Light of mine, I'm gonna let it shine...This Little Light of Mine, I'm gonna let it shine...This Little Light of Mine, I'm gonna let it shine. Let is shine, let it shine, let it shine!" Do I need to say more? I've been teaching Mama Rob and Mama Dot soooo much on this journey. (Sometimes, I have to teach them the same lesson over and over...Humans!). Anyway, this time, the lesson is also for me. I learned it the hard way. I didn't respect a skunk I encountered. I made an assumption (not a good thing) that I could get the best of the skunk. WHEW! (Literally) Was I wrong! People make assumptions about me all the time. They think a certain way about a poodle. I don't take it personlly. I just lean in and love 'em! 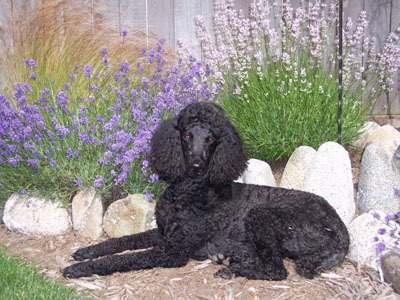 Then, they get to see that I am different from what they thought they knew about poodles. From my encounter with the skunk, I learned a lot about not making assumptions and respecting differences. I hope you take this lesson to heart and apply it in your life! Ancaro Imparo. Ok, so my ancestors came from Germany, and that saying is Italian, and was spoken by Michealangelo after painting the Sistine Chapel. But translated into English, it's still a good one...I'm Still Learning! Progress, folks, not perfection! Anyway, if it's good enough for a gay man, it's good enough for me and my Mamas! Life is An Adventure...Enjoy the Ride...It's Worth the Risk! I was listening to "The Most Profound Question" with Mama Rob & Mama Dot, and then saw Snowy sticking his head out the window and realized, "Wow! That's Me!" 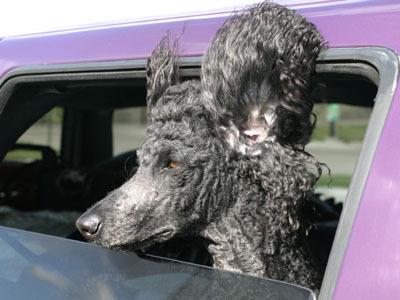 Folks, it is totally worth the exhiliration you receive when you "stick your head out the window! Just do it!" My mamas say they learn from me every day. Now...here's me...you can see how much Snowy and I have in common. Life just doesn't get much better! Write me and share your story about your dog and what you are learning every day!